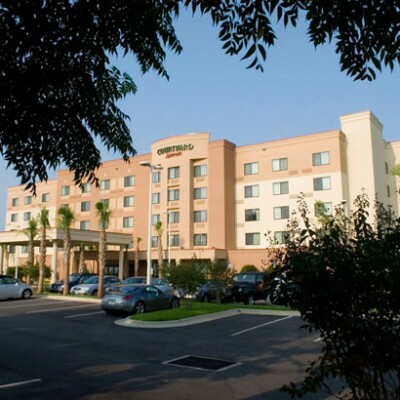 At the Courtyard by Marriott Hotel Pensacola Downtown, you’ll find beautiful accommodations conveniently tucked in the charming historic downtown district, just across from beautiful Pensacola Bay. With warm, personal service and amenities that offer so much more than you might expect, your visit may seem a bit too short. At the Courtyard Pensacola Downtown hotel, you really can have it all. Enjoy being within easy walking distance to all of the downtown area’s best restaurants and venues like McGuire’s Irish Pub, the Fish House, Dharma Blue and the Seville Quarter Entertainment Complex. You’ll also be within easy driving distance to Pensacola Beach, NAS Pensacola and other top destinations in the area. Whether you’re visiting for work or pleasure, you’ll feel right at home at the Courtyard by Marriott Pensacola Downtown, where you’ll find the perfect blend of fresh, contemporary accommodations and good old-fashioned Southern hospitality. We understand the hassles of travel and we’ve thought of everything! Business travelers will appreciate our complimentary in-room Internet access, business center and ample meeting space to accommodate up to 50 guests. Other welcome conveniences include an on-site market-convenience shop, top-of-the-line exercise facility and beautiful, spacious guest rooms with extra plush bedding for the ultimate night’s rest. Whether you’re in Pensacola to get down to work or to let your hair down and relax, our downtown Pensacola hotel, with its bayfront views, is the perfect retreat for business or pleasure. Contact us today because we’d love to hear from you!